County councilor Jill Gaebler. Photo courtesy of Jill Gaebler. 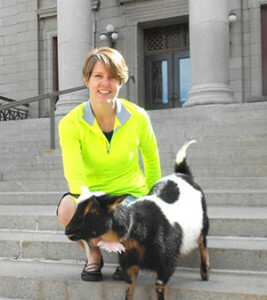 When Colorado Springs passed an ordinance allowing residents to own small dairy goats within city limits, City Councilor Jill Gaebler knew it was an important step toward a more sustainable food system in the city. Although Gaebler realizes it was a small win, she also believes it helped put urban agriculture on the agenda of a city that is still very much a food desert. According to Gaebler, Colorado Springs is behind the rest of Colorado when it comes to promoting urban agriculture. The city only currently produces about four percent of its own food, does not have a public market in its downtown, and still has various legal barriers that limit small-scale food producers. In order remedy these issues, Gaebler is working on several efforts to facilitate urban agriculture in Colorado Springs. First on her agenda was the dairy goat ordinance which passed May 27. She has also worked with local food groups to develop a public market in downtown Colorado Springs and is trying to assemble a food policy council in Colorado Springs by the end of the summer. Gaebler has brought together various representatives from local nonprofits and food-related groups to gather their input and develop a mission for the council. The group has examined other food council models in Colorado and throughout the country to get ideas and develop a plan. Gaebler is adamant about incorporating feedback from all local food groups in Colorado Springs and getting everyone on the same page, because she believes her efforts will only be successful with the support of the entire urban agriculture community. Considering the conservative political climate in Colorado Springs, Gaebler believes it is unrealistic to expect local government to invest financial resources or actively promote urban agriculture in the way other major cities have. However, she is dedicated to helping small-scale producers in the city in any way she can. Despite some opposition, there are also many groups and individuals who support urban agriculture in Colorado Springs. When Gaebler ran for election last year, she was contacted by a group of people who wanted her to support their efforts to start a public market in downtown Colorado Springs. Additionally, Gaebler says there are many nonprofits in Colorado Springs working toward a healthier and more sustainable food system. Pikes Peak Urban Gardens has been particularly influential in the area, says Gaebler. The executive director of the organization started a project called The Pollinator Project in which he went into a lower income neighborhood in Colorado Springs and offered to build raised beds in the yards of local families. The goal of the project was to make fresh, healthy food available to those in low-income neighborhoods who often don’t have access to it— a service that is very much in need according to Gaebler. Slowly but surely, Gaebler’s efforts and the efforts of other urban agriculture proponents in Colorado Springs are helping the community realize the importance of local food. Gaebler intends to further this impact through the food policy commission, which she hopes will be approved by the end of the summer.